One of the common problems that SugarCRM shares with other PHP-based applications is a vulnerability to Cross-site Scripting (XSS). The fact that cross-site scripting, which is also known as XSS is a common attack, similar to SQL injection, does not make it less dangerous. A malicious script injected via XSS can potentially compromise all aspects of our business information security – confidentiality, integrity and availability of information we rely on. A SugarCRM professional may simply refer to a button that says “Remove XSS” on the admin portal. Unfortunately, if it sounds too good to be true, it probably is! There is little explanation in regards to when to click the “Remove XSS” button. How often should we do it? Most SugarCRM admins have limited knowledge of script-related security solutions and not everyone can afford an advice of security consultants. Do not despair! 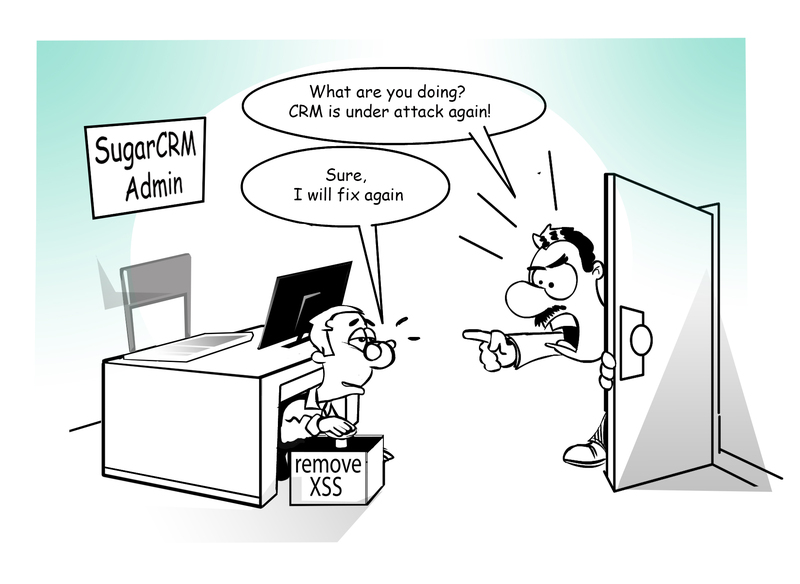 There is a way to resolve XSS threats to SugarCRM by utilizing Content Security Policy or CSP. Hailed as a holy grail of security policies, CSP came standard with all major browsers. It serves as additional level of security for browsers and is designed to mitigate XSS and sniffing attacks. Header always set Content-Security-Policy "default-src 'self'; script-src 'self';"
CSP 2 combats these threats by adding support for hashes and nonces for style resources and scripts. (Nonces are cryptographically strong random values generated on each page load). Nonce usage can also help minimize a list of allowed source URL values. This does not make CSP2 a perfect solution, but it helps us adjust script_src attribute without weakening it to unsafe_inline, which would be unacceptable. A very good example of a company implementing CSP into their product is Google. The company went extra mile to secure its Chrome browser extension by implementing the most stringent CSP as default configuration. Google advises against relaxing CSP settings for Chrome extensions. Our Yathit extension has the strictest and most effective CSP. It has script-src attribute without relaxation of the extension’s security settings. Yathit has superior security features than the other SugarCRM extension on the browser end. These specific features stand out when it comes to email and client information management. We highly recommend our users to experiment with CSP deployment, and Yathit security features.